Jay Williams’ teammates on the Grossmont College football team joke that he never smiles for his photographs. But Williams had a big smile on his face on Dec. 19 when he signed a letter of intent to play for Florida State University. The 6 foot-6 inch, 290 pound offensive tackle chose the Seminoles among 20 offers he received from universities across the country, including the University of Arkansas, University of Indiana, and the University of Oklahoma. At a signing ceremony alongside Grossmont College Football Coach Mike Jordan, Williams thanked his family, coaches and teammates for believing in him. Williams, who grew up in Moreno Valley, was a walk-on for San Diego State University’s football team after he received no offers from Division I universities. He came to Grossmont College in May 2017 after he was cut from SDSU’s team. Williams shined at Grossmont College, where he was nationally ranked 8th at his position and became one of the most-recruited junior college football players in California. Grossmont College President Nabil Abu-Ghazaleh said William’s success shows the broad level of support he received at the college. Football players and other athletes are required to attend school full-time, maintain at least a C average, and follow an education plan that leads to a degree. “It’s clear that football is a team sport, and the team is much broader than the players on the field,” Abu-Ghazaleh said. Williams majored in exercise science at Grossmont College, and he plans to major in sports management at FSU. 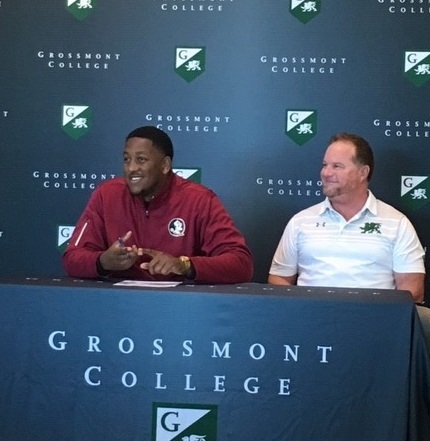 He said he never dreamed as a high school player that he would one day attend a football powerhouse like Florida State – all as a result of being a student athlete at Grossmont College.